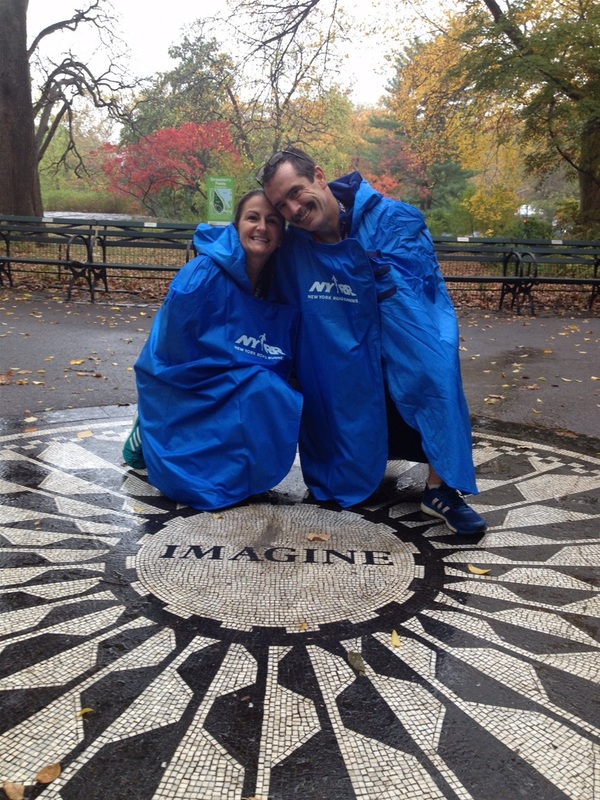 2013 was my first NYC Marathon when I ran for “Team for Kids” Charity and raised $2,620. This was my first big marathon and I set out with no time goals other than to finish. I LOVED this marathon. I was quite spoiled too! Team for Kids provided a heated tent, bagels, coffee, hand warmers, private port-o-lets; it just doesn’t get any better than that! They even gave us a quick pre-race warm-up and walked us to our corrals. The crowd support, the entertainment and the energy was like none other. After that year, when people told me that they were running the NYC my excitement just poured out! “OMG – you are going to LOVE it! Running the NYC marathon is hard to put into words. There are so many highpoints that continue to be the same year after year. Running over the Verrazano Bridge and having the helicopters hovering is such a surreal experience. It’s intimidating but at the same time it’s mind-blowing! Running through Brooklyn and hearing the music on each street corner. There was no time to even think about pain or endurance. Running off of the Queensboro Bridge and hearing the roar from the crowds as you exit the bridge is another highlight. I couldn’t believe the crowds! The noise was almost too loud! Running through the “entertainment” sections – hearing the music; the energy, the excitement it indescribable. 5th Avenue was another high point. There is a 3.5 mile straightaway that seems to be an endless road but the signs, music, cheering were a huge distraction. All I can say was Harlem was pretty cool! There was a DJ yelling and screaming at the runners and was getting the crowds pumped up. Finishing in Central Park with the crowds cheering or you on both sides was indescribable! I felt like an elite runner! Post Marathon – I like to refer to this as the death march when you exit the park. You’re given those amazing ponchos and all you see is ahead are blue hooded ponchos. They look like a scene from a sci-fi movie. This marathon is a lifetime experience that I feel that any one that loves to run should experience. 2014: I ran it again but this year I had a time goal to Boston Qualify. I started out feeling great. I found the 3:30 pacer and kept up with them until around mile 20. I am not sure what I was thinking since my PR was 3:45 and shaving off that much time is pretty aggressive. I think I had forgotten about the hardest parts of the marathon as I was approaching mile 19. It’s sort of like child birth, we tend to only remember the birth only; that exhilarating moment when I was holding that beautiful new born baby, kind of like when we cross the finish line and we are holding that medal! What happened to those last 7 miles (or 24 hours of labor) when the course seems endless and uphill! New York City marathon is a hard course! I think it’s tougher than Big Sur, but it’s that endless crowd support and excitement keep bringing me back! 2016: I ran again with yet another experience. Kim and I didn’t pack any food or snacks for Staten Island expecting the Dunkin Donuts to be there feeding us power bars and bagels. That year the bus was delayed and we went right into our corrals missing the food. The only nutrition we had was a GU that we split before we started. We were hungry but started feeling good. The first 20 miles were the same as the first few years. We were running low 8 minute miles that felt effortless. Then, as we approached mile 21 we both hit the wall HARD. I never felt that wiped out running a marathon and I finally understood what “hitting the wall” felt like. Being under fueled is the worst. It took hours after the marathon to recover. 2017: Yes, I signed up again forgetting the pain of 2016. I’m so glad I did because this was the year that my love for NYC came back. I ran again with Kim not trying to PR or BQ but to run “for fun”. We packed so much extra food this time and we both ate well in advance that we never “hit the wall”. When you see those ads for the NYC marathon and they say “It will move you”, they aren’t kidding. Again, those same moments that I experienced in 2013 came back stronger than ever. Even when we got to the last 6 miles that were uphill to Central Park, I still felt that “It will move you” feeling. I LOVED it. We finished strong and I held that medal like holding a new born baby! Priceless. All I can say is I hope and pray that my health and body will not fail and I will be able to run it again. I can’t wait for 2018!